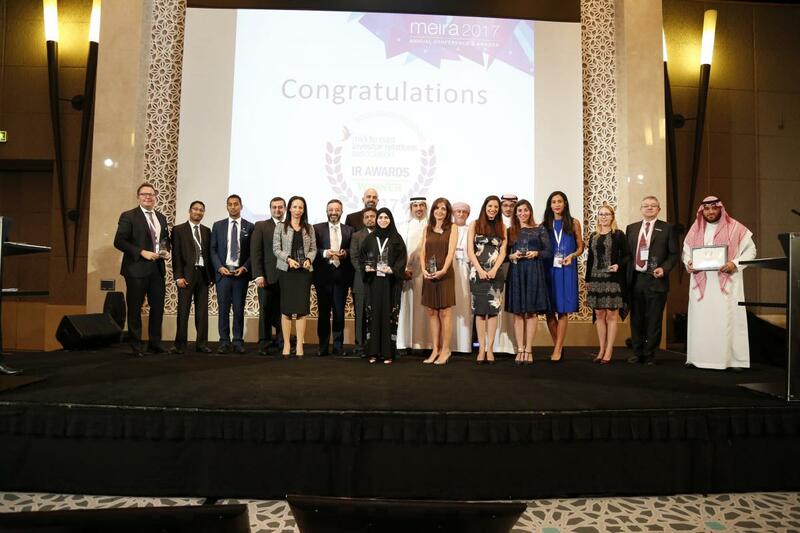 21 September 2017 – The 9th Middle East Investor Relations Association (MEIRA) Awards Ceremony honoured Investor Relations (IR) professionals and companies across the Middle East that demonstrated outstanding performance in IR best practice and overall corporate governance on Wednesday 20th September in Dubai. The Awards Ceremony was part of the 2017 MEIRA Annual Conference, the largest event dedicated to IR in the region, which this year focused on accelerating efforts toward industry best practice. This year’s conference ran under the theme: “The IR hyperloop: Driving Transformation to Unlock Tomorrow’s Value” and examined the latest trends and developments in the industry. The award categories included the top-performing IRO’s, leading Corporates, CEO’s, CFO’s in IR for the Middle East region, leading corporates and professionals on a country level across the region, and companies that demonstrated the best year-on-year improvement in IR practice overall, best annual report, and best IR website. The rigorous selection process is run every year with leading global benchmark assessors, including Extel, MerchantCantos and Comprend, providing the leading standard for the region in industry recognition for outstanding performance. Commenting at the Awards Ceremony, Alex MacDonald Vitale, Chairman of MEIRA, said: “Each year, we acknowledge our peers in the industry who have truly demonstrated leading excellence in IR practice either at an individual or industry level. Through these awards, we have established a competitive benchmark for professionals and organisations in the Middle East to further advance best practice in IR across the region. It is very encouraging to see continuous improvement year-on- year, with an ever broader cross-section of industry participants and winners represented in each of the categories”. Through the Awards, Conference and other industry activities, MEIRA has demonstrated its commitment to promoting best practice across the region over the past nine years, working with local authorities and listed companies to foster a robust and transparent environment to attract and retain international investment. At the Conference, MEIRA launched the Middle East IR Practitioners Survey report, in partnership with recruitment specialists Hanson Search, which looked in detail at the role of IR in the region today and career-related aspects for the profession of IR in the Middle East, including compensation, team structure, reporting, gender parity and other KPI’s.